We all need a showstopping piece to bring along to a party or celebration. I make these cupcakes once a month or so. They were the centrepiece at a confirmation last year, an 80th Birthday Party and a 50th Birthday Party. 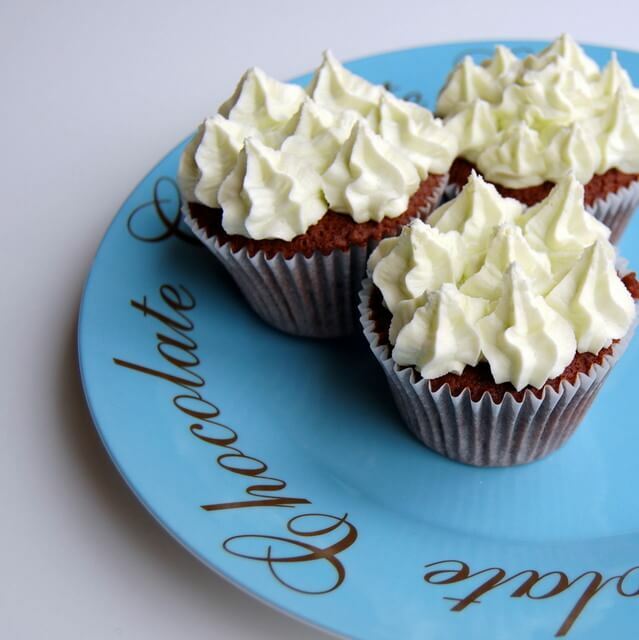 I love making these cupcakes as they are so moist and travel well. I do need to point out that this originally was not my recipe. I’m not entirely sure where the recipe came from but it was provided to me by Cupcake Queenie. I’ve since tweaked it (more than a little from the original) to our families’ tastes and they are the most requested treat item when we have a family reunion. This recipe will make 12 cupcakes. If you’re Irish this means 12 buns in muffin cases, make sure to bake them in a muffin tin to get the right shape. Place the chocolate & water in a small saucepan & heat very gently, stiring regularly, until all melted & combined. Put the margarine into your mixing bowl & beat briefly, then add sugar and golden syrup & beat well. Add eggs one at a time, beating until light & fluffy. Add the pepermint essence & mix through. Pour your batter into your cases. put two pieces of the broken After 8’s into each cupcake, pushing under the batter. Bake at 150 degrees for 30 mins approx. The cakes are more dense & moist than a standard sponge, but will not be actually gooey inside. Leave on a baking tray to cool and ice if you want to. I use my standard simple icing/frosting recipe and replace the vanilla extract with 2 teaspoons of peppermint essence. Pipe if you want or simply spread on with a knife. These cupcakes will keep for up to 5 days in a sealed dry box but I doubt they’ll last that long. Sorry it’s probably me but it’s not clear when does the choc mixture get added? Is it to the eggs and marg? Gosh no its grand. It’s just they look yummy so I’m definitely going to try them and I’m glad I asked because i would have ruined them by adding it earlier and probably curdling the eggs. Thanks a million. Love the blog by the way, great for fresh ideas.